This product is made well and the color is good. Also, good customer service. Comfort,color and protection all in one easy product!!! 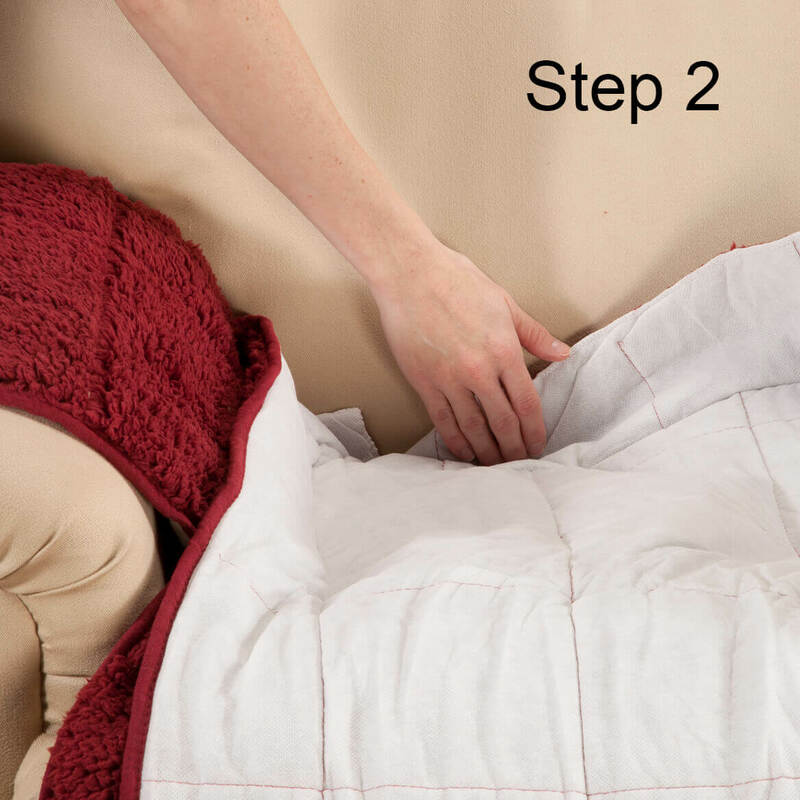 The cover is comfortable and soft. I put it on our recliner that is in our bedroom for my use. It goes well with our colors. We have no pets. Easy to put on and very soft and comfortable. I wanted something that would cover my leather recliner where it is worn. It does cover most of it. It is very soft and cozy. The color maroon goes with my decor. 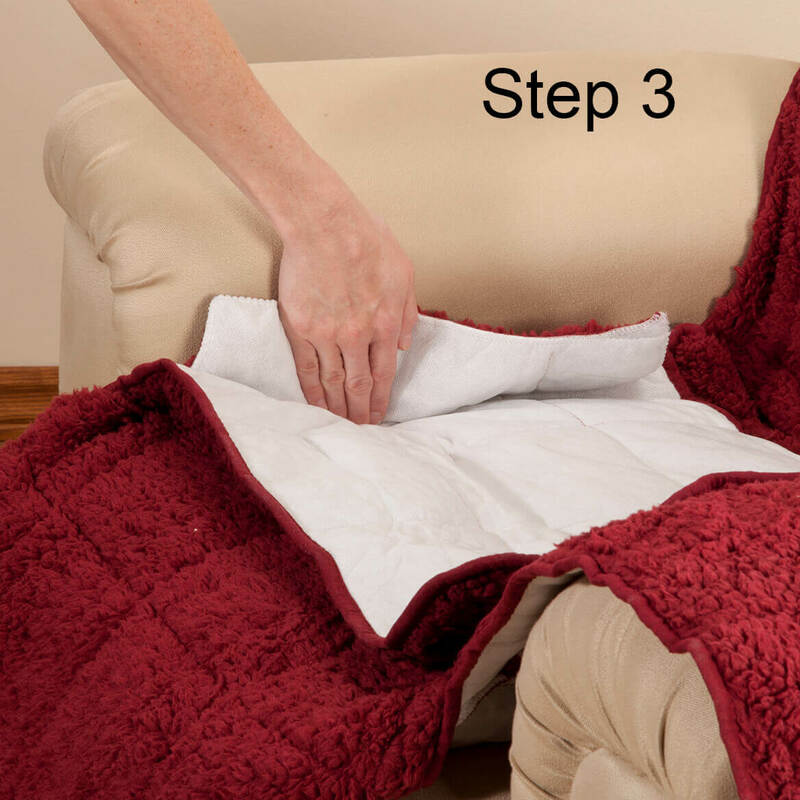 It does slip on the leather and have to straighten it everytime you get up, but it isn't hard to do. 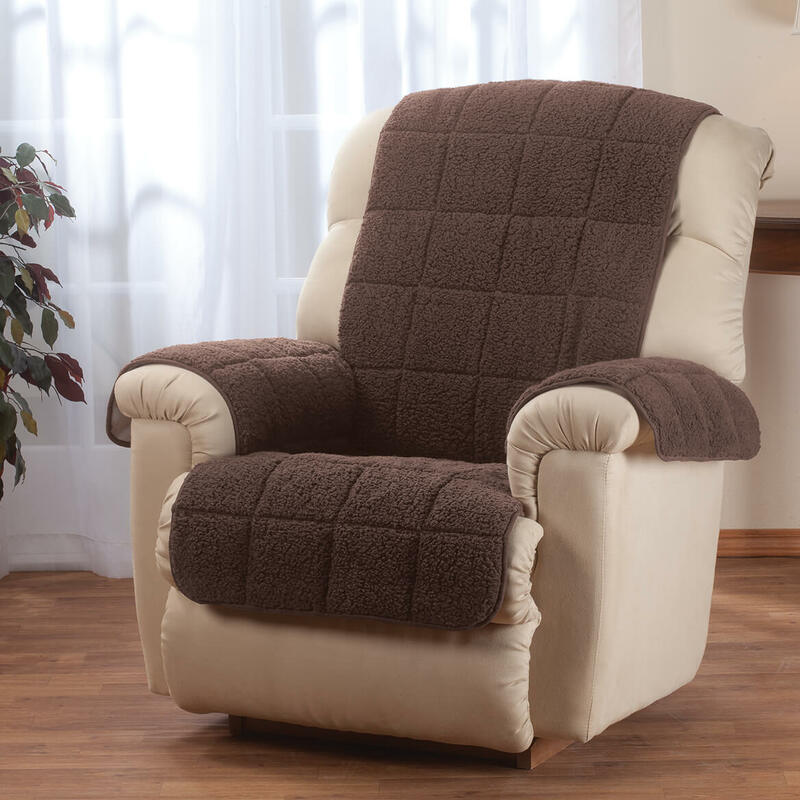 Bought this because our leather recliner feels cold and I thought the fabric would make it more comfortable. Unfortunately, while the fabric is nice, the backing is very smooth and the cover slides around on the leather. A slightly rubberized backing would probably stay put much better and would make it much more useful on a leather recliner. I would recommend it, but with a warning about the slipperiness. Use is satisfactory but back keeps falling down into seat. I am very disappointed in this recliner cover. The back is way too short, therefore the back falls down every time you sit on it. Also the arms are only partially covered because the arms of the cover are too narrow. descriptions on ad are deceiving. 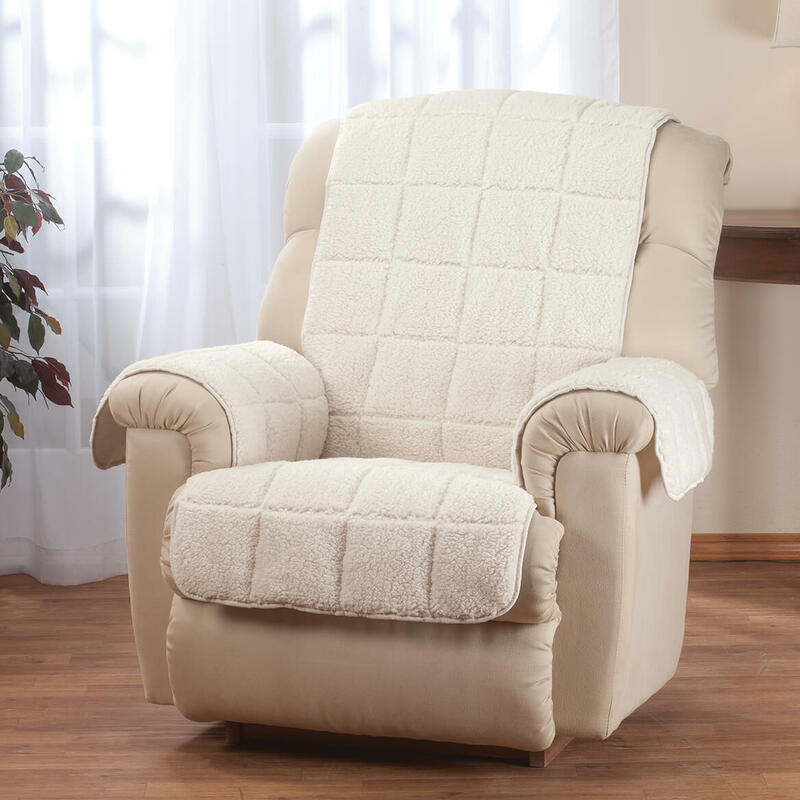 It is cheaply made and does not fit the standard recliner. It is not worth the money I paid for it. 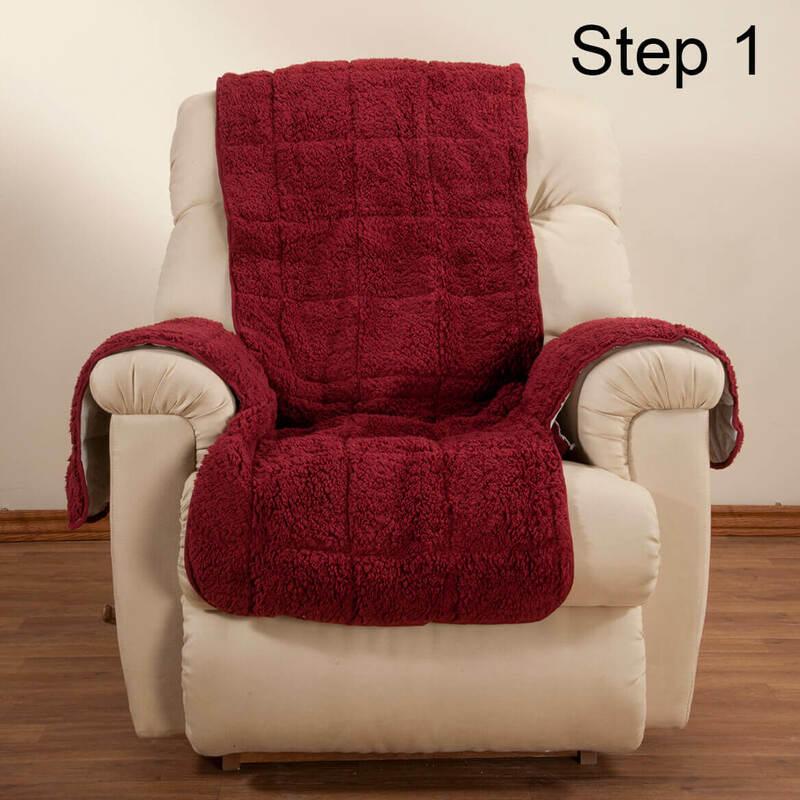 It is not made well,tabs are to short and do not stay tucked in,which makes the chair cover always look wrinkled.The back flap is also to short, it always slids down..
Have been satisfied when I received others and realized I needed one more. Glad it was on sale in the color I needed. 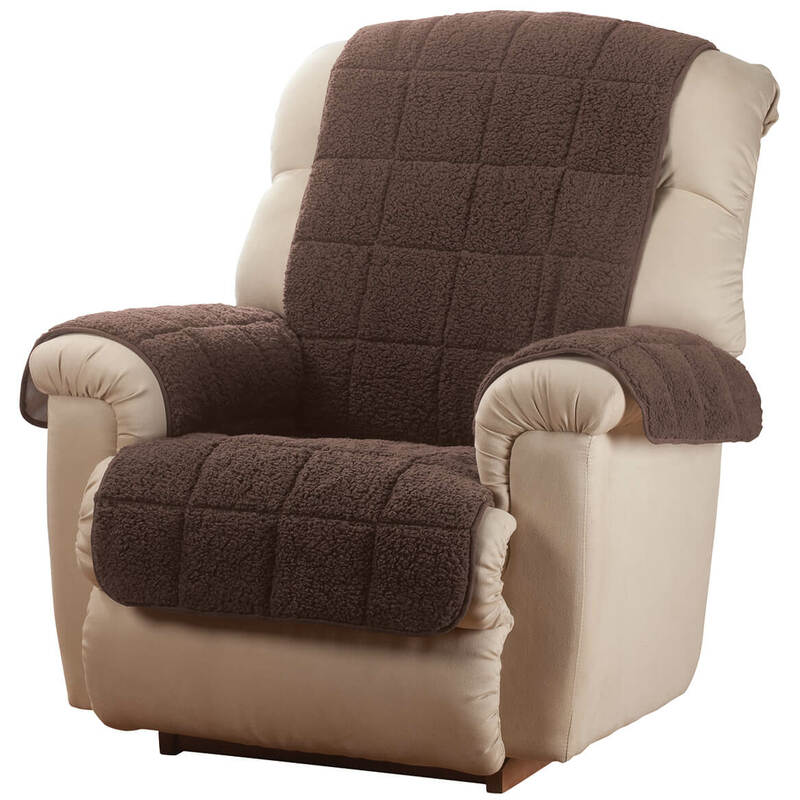 Wanted a natural color recliner cover, hard to find, until I saw your store. To help keep his recliner cleaner. I purchased the other Recliner Cover several months ago and the straps did not fit around our recliner. I also like the fact that this one is water proof. Because we have 4 small dogs & we have 2 young grandchildren. Waterproof is wonderful! They looked like good quality and is water proof. 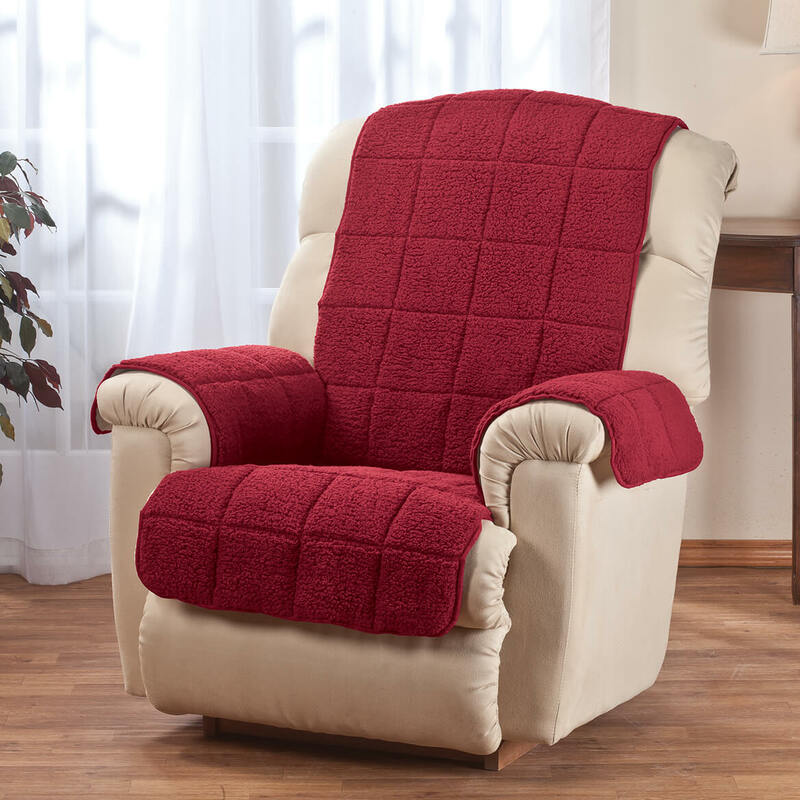 looking for a light and dark covering for a recliner for our seasons. To protect my new lift chair. Need a soft, comfortable surface on my leather recliner. It's waterproof. Looks like it may be comfortable to sit on. Looks easy to put together. I sit in my recliner often and want to protect it from over use. One of the few reasons because it was waterproof and another was it had the longer back and it doesn't show a strap I hope anyway. Husband needs a cover for his chair. 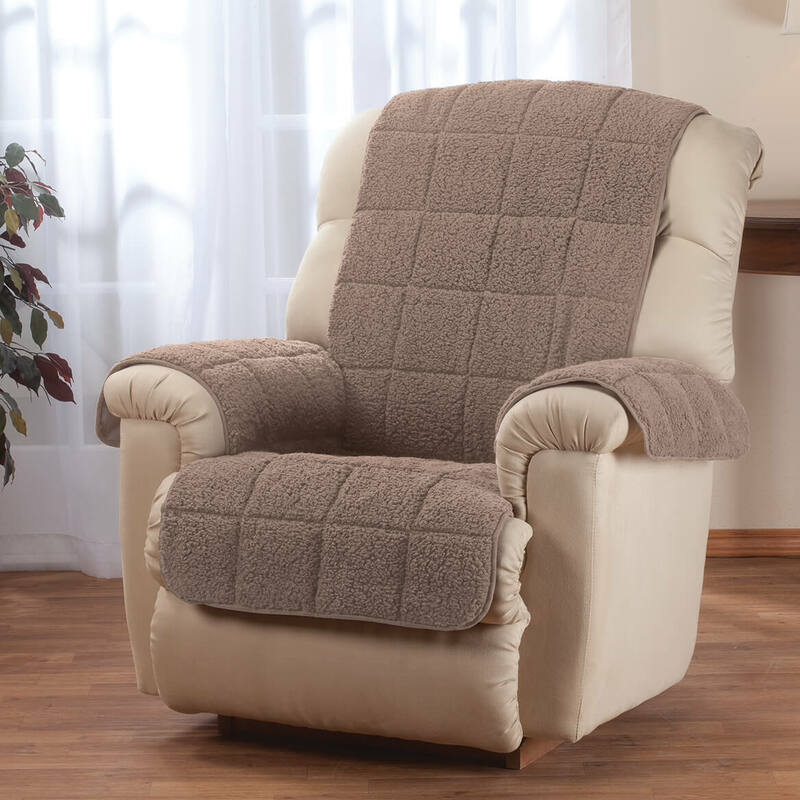 I chose this item because it looks like it will do the job for my big recliner and it is not difficult to put on. I though it would protect the chair, but no it would not stay put. Appears to be useful in covering stained reclinere. I was looking for a cover for our new chair to protect it from dirt and moisture. Hopefully this will do both as well as stay in place on the chair. My recliner was showing signs of wear so I needed something to cover it. Is this a one piece including the arm covers and how long does it fall in the back? If the arm covers are separate, I can see them falling off. BEST ANSWER: This is all 1 piece. There is a fair amount of overhang in the back which keeps it in place. We are very happy with ours. It is all one piece including the arm covers. Depends on how big your chair is as to how long it falls in the back. Ours falls about 11" from the top of the chair. It is all one piece. The back is always falling down. It has no attachments to the chair. It is all one piece. The back falls about 6 inches. It covers nicely. How wide is the portion which covers the chair arm? I am concerned that my chair's arms are too short and that the covering will hang over the front of the chair arm. BEST ANSWER: Thank you for your question. The ARMS are 21"Lx16"W.We hope this information will be of help to you. how can I keep covers from slipping off? BEST ANSWER: When you find out how to keep covers from slipping off, please let me know! Mine slips a little, but I am disable and I have many pillows which hold me in position and also keep the cover in place. I don't think it would slip too much even if I had nothing else in the chair. I have a similar cover on a love seat for my dog. She is very active jumping on and off and it does not move. I suppose you could secure it with ties if it becomes a problem. They should make with the overhang and "tuck in" fabric more generous for sure. I'm thinking about using some peel and stick velcro. Good luck. What country is this product made in? BEST ANSWER: Thank you for your question. This is made in China. We hope this information will be of help to you. BEST ANSWER: Thank you for your question. This item should be line dried and hung out to dry. We hope this information will be of help to you. 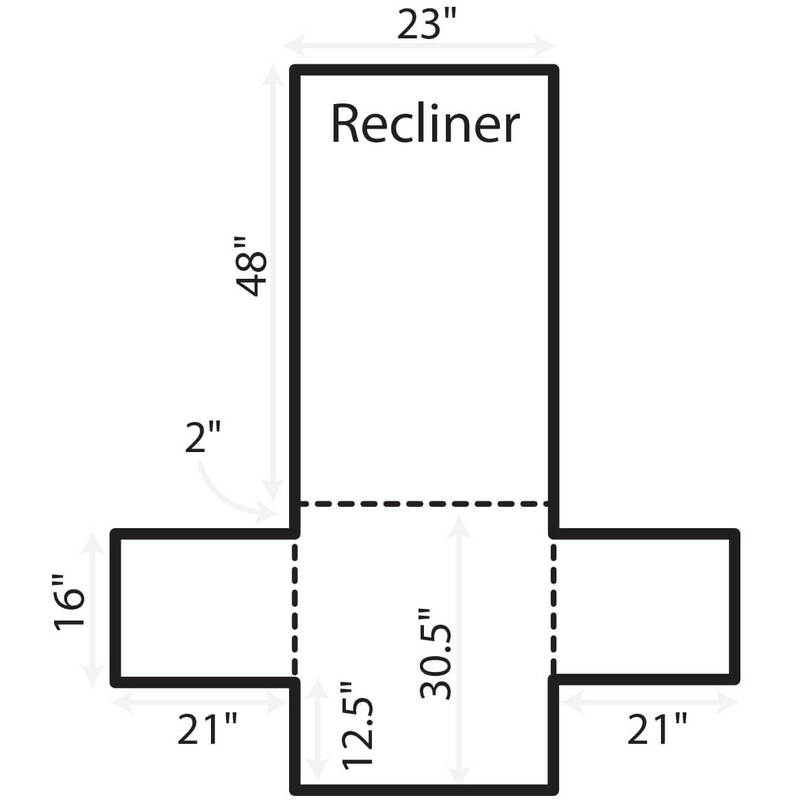 Will this fit a "Lazy Boy" Small Recliner? Back 48" L x 23" W.
BEST ANSWER: I haven't tried to wash mine yet, but it is suspose to be. I do have trouble keeping it in place. Do you have a suggestion for this problem? Otherwise, I like it. Yes, just washed ours for the first time, came out fine. BEST ANSWER: Thank you for your question. This item is 100% polyester surface with 100% olefin backing and is machine washable.We hope this information will be of help to you. Does it breathe? My chair gets too hot so I'm looking for a cover that will let my body heat escape so it will be more comfortable to be in. Thank you i appreciate your help. BEST ANSWER: Thank you for your question. From the time your order ships you have 45 days to return it for refund. We hope this information will be of help to you.